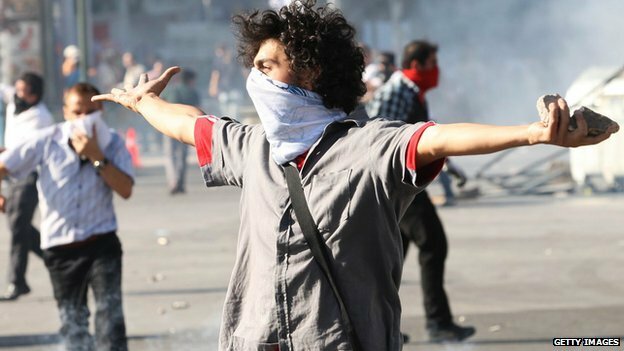 Turkey has been rocked by days of anti-government protests. Travel reporter Angelica Malin was in Istanbul as the unrest spread, enveloping her hotel, and was forced to get the first plane out. The excitement was contagious. At 14:00 we were standing on Dolmabahce Cadessi, the road leading to Taksim Square, a mere 2km (1.4 miles) away, in our best sandals and sun dresses, watching thousands and thousands of people pour into the streets. The same repetitive chant, demanding Erdogan’s resignation, could be heard all across the city – along with car horns, rioters hitting saucepans, pots and drums. It was exciting. Tour buses had been taken over, filled to the brim with rioters, and people waved their flags gleefully in the air. But as we had lunch at a rooftop bar things started to get serious. We watched in horror as staff pointed out the clouds of tear gas floating our way from Taksim, asking us to move inside the restaurant. Someone told us that the items we had seen being sold on the street earlier – bottles of milk and halves of lemons – were being used to counteract the effects of the gas. Within hours, everything had descended into chaos. Back at our hotel, we were forced out of the terrace bar as our eyes stung and it felt like we’d swallowed pepper. As soon as we were inside, we realised the full extent of the conflict. 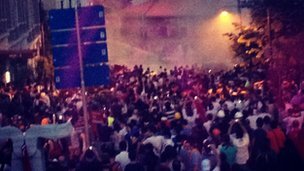 Right in front of the lounge bar window, the courtyard was a site of utter chaos – thousands filled the street, as the riot police outside the Shangri-La hotel were violently pushing protesters further into the side streets with tear gas and water cannons. We watched in horror as men covered in sweat poured lemon into their eyes, women clutched their friends, and some of the bravest of the protesters who had been at the very front, their shirts torn, sat on the floor in fits of coughing. As night began to fall, it brought with it anarchists and more violent protestors. The more peace-loving protesters in the lounge next to uscondemned this violence. We witnessed rioters pulling security cameras off the walls and yelping with joy, graffiting the walls, and picking up pavement slabs to throw at the riot police. At this point, the lounge contained a mix of a Turkish protesters – what we believe were friends and family of hotel staff – and horrified tourists wearing gas masks. We felt trapped. We had no information – the Turkish news channels seemed to be focusing on other stories, and we could not reach the British Embassy on the phone. The bottom floor had been turned into a make-shift hospital, with the in-house hotel doctor treating the effects of gas. At one point, when the room service arrived (after five hours, but this was hardly a time to complain), we realised the extent of the damage inside the hotel – the waiter apologised profusely, explaining that it had be hard to prepare the food as the gas had got into the kitchen. His eyes were red and swollen and we gave him our gas masks – the least we could do. By the early hours of the morning, the hotel had become a conflict zone in its own right as the riot police had managed to push all the protesters up a side street to its right. We were told to stay away from the windows, as a brick came crashing towards us at one point. The gas was too strong and we could not stay in the lounge without weeping. A Turkish person informed me that the group we saw protesting was the youngest, most fundamentalist group, known for its violence. When we left at 04:00, desperate to catch the first plane out of Istanbul – direct flights to the UK were full so we had to go via Paris – the streets were eerily quiet. There were barricades, a few small fires dotted around, and only a handful of protesters still in the streets. Everything had been scrawled with an “A” for anarchy, and the city we had seen earlier in the day was unrecognisable. This entry was posted in News and tagged anti-government protests, camaraderie, gas masks, İstanbul, peace-loving protesters, Riot police, Taksim Square, tear gas, Turkish news channels on 3 June 2013 .